Following up on our Protestant Reformation reference, let’s jump in with the goings on over at Ntre Ame. Remember when beating Notre Dame was a significant accomplishment? Seems like it’s what all the cool kids are doing these days, if you count the Golden Hurricanes of Tulsa as one of the cool kids. By the way, it’s still not a good idea to Urban Dictionary “Golden Hurricane” FWIW. The Irish lost their QB, Crist, for the season… if only his name had another letter, he’d be back in a couple of days. The game ended on an interception in the endzone from a Hurricane named Flanders… surprising given his relationship with the faith. From what I’ve read online the play by play commentator for NBC said “and that’s the final nail in the coffin…” Probably not the wisest choice of words, given the circumstances. One thing that concerned me about the horrible tragedy that happened with the video guy is the way that everyone was using it as a storyline. Let me get this straight- the tragedy was a rallying point of inspiration for the Irish, until they lost. Then, they couldn’t have won because of their heavy hearts. I understand the need to make meaning of these types of situations, but it just seems incredibly disrespectful to trivialize this for interest stories or university PR. Again, just my $.02. 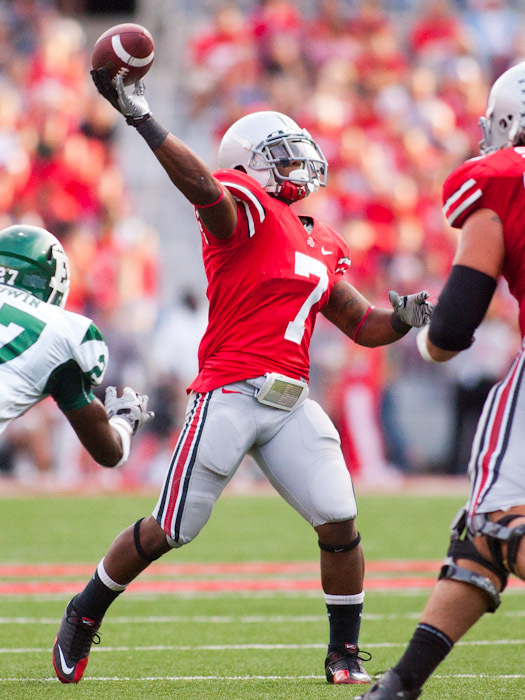 Cole brings this week’s highlights from the Big Ten Player of the Week- Terrelle Pryor. He runs, he throws, he catches… That’s an action figure there, son. Just a quick follow up to our Friday requests… and no, Joe, you still didn’t get a pony. No injuries- Well, no “injuries” per se, but the cramps and dings are something to be concerned about as we enter the conference season. Stoney’s high ankle sprain is something to keep an eye on, though. A shutout- Fail. While Heacock likes having teaching points, and the defense needed something to light a fire under them, giving up three scores to Eastern Michigan is not something that makes us happy. In a game that was never remotely close, the Buckeyes handed the Eagles of EMU a 73-20 loss that displayed plenty of offensive flash, and a couple defensive question marks. Terrelle Pryor was the star of the day with 6 total touchdowns including 4 passing touchdowns to Dane Sanzenbacher (9 rec 108 yards), a 53 yard rushing touchdown and a receiving touchdown thrown by former High School teammate Jordan Hall. The Buckeyes put the majority of their effort in the passing game and it paid off as they hit 13 different receivers for 303 total yards in the game. The 73 points scored in the game were the most in the Jim Tressel era, topping the 58 points scored on Northwestern on September 22nd, 2007. The previous time OSU had scored more than 70 points in a game were the first two games in 1996, 70 points against Rice, and 72 against Pittsburgh. This game also saw the most points scored by OSU since October 28th 1950, when the Bucks scored 83 on a 3-5-1 Iowa team. The Buckeye offense was near unstoppable in the game today. The Buckeyes wracked up 645 total yards of offense with 342 rushing yards to go with their 303 passing yards. The only turnover the Bucks gave up was a fumble late in the game when walk-on Tight End Ricky Crawford dropped a pass from Joe Bauserman after bobbling the reception. The Buckeyes managed to have 11 players run the football for positive yardage, including Terrelle Pryor’s game leading 104 on 7 attempts. The longest run of the day went to Jaamal Berry with a 67 yard touchdown scamper late in the game giving him 74 total yards for the day. Dan Herron appeared to be the primary running back during the game – unsurprising with Saine’s injury from practice – collecting 12 carries for 55 yards and an early touchdown. How long will Evil Tressel let Pryor put up Heisman stats against EMU? Eastern Michigan is bad, really bad. So bad that it is hard to find a place to start describing their ineptitude at playing the game of football. Since I like to focus primarily on Ohio State in these previews, and as readers of this blog, you presumably care primarily about the Buckeyes, I will keep this as brief as possible. Eastern Michigan has not won a football game since 2008. 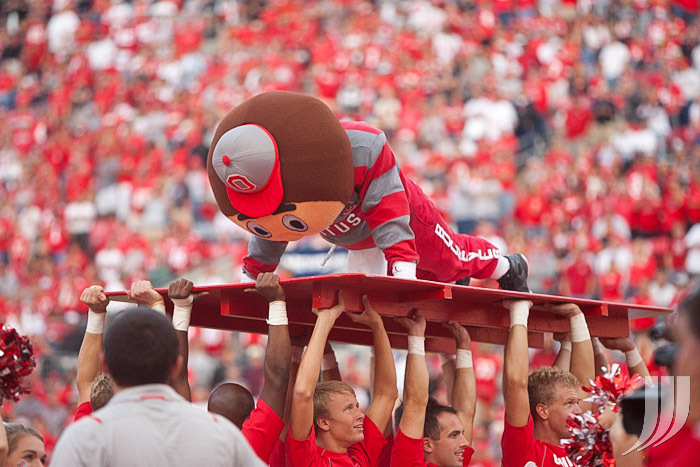 Ohio State has some things they need to work on this week as they prepare for Big Ten play. Dane is good at getting the team fired up to meet our expectations. The game on Saturday will be a little more than a scrimmage for the Buckeyes as they prepare for the Big Ten schedule. It is not the most exciting game for fans, but if anything, the low quality of the opponent increases the expectations. Here are some things that we want to see from the Buckeyes on Saturday. A 40+ point win- Put them away and do it fast, then let the backups run a typical playbook, not the vanilla run-only playbook. No injuries- Put the starters on the bench fast and avoid what happened to Beanie Wells against Youngstown State. Tags: Eastern Michigan, football, Ohio State, what do you want to see? It is I, Ron English. Upon looking up the name of the head coach of Ohio State’s opponent this week, I thought to myself “That name sounds familiar,” but I couldn’t quite remember from where. Then, upon seeing the picture of Eastern Michigan’s coach coupled with the name, I thought to myself “Wait a second, I’m pretty sure I do know this guy…” A few lines into the biography on the EMU athletics site and my suspicions were confirmed: This was Ron English, as in the former defensive coordinator at a certain other school in that state up North.